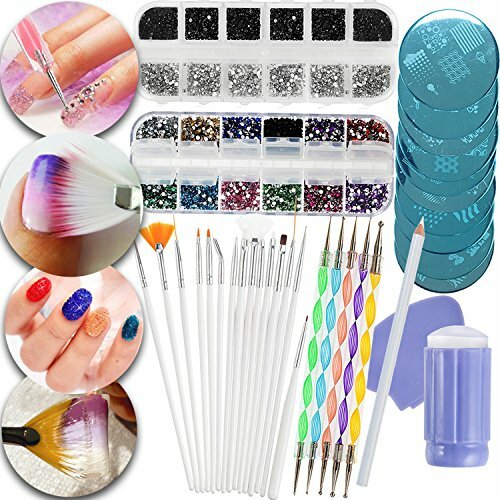 Professional Nail Art Decorations and Tools Set With Self Adhesive Guiding Stickers, Crystals In Different Colors, Double Ended Dotters, Brushes, Stamping Plates, Stamper, Scraper and Rhinestones Picker Pencil. SUPER FASHIONABLE DESIGNS: These fabulous nail decorations will simply make your friends speechless with admiration and they surely will want to know where did you get them! PROFESSIONAL TOOLS: Application tools for nail art that we offer in this set are of high quality and ideal for use by hobbyists as well as in professional nail studios. MULTIFUNCTIONAL: You can use these lovely decorations not only on your nails, but also to spark up your phone, tablet, notebook or make your invitation and greeting cards the hit among your friends. GREAT VALUE: With sparkly crystals and best application tools we offer you a stunning amount of decorations for your designs for a surprisingly low price! If you have any questions about this product by VAGASHOP, contact us by completing and submitting the form below. If you are looking for a specif part number, please include it with your message.